C200 Cassette® Toilet (2352157) by Thetford®. W/O Water-Saving Hand Sprayer. 19-11/16" Length x 13-7/8" Width x 21-3/16" Height. Square Front With 19-1/2" Seat Height. Permanent Base With 180 Degree Rotating Bowl. 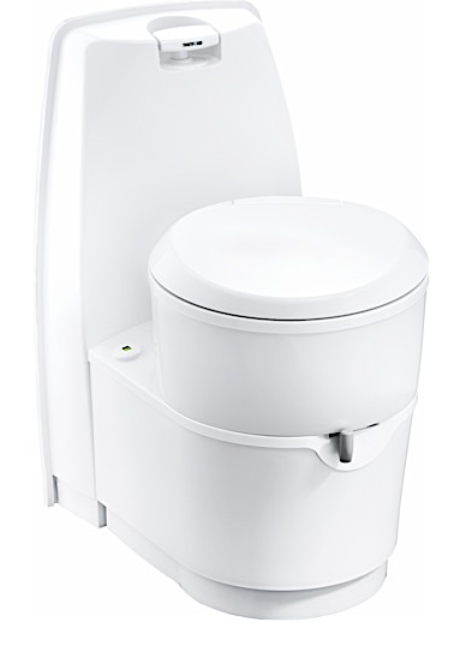 For maximum comfort W/O losing space, the toilet bowl revolves 180 Degree on the base; simply press down on the seat and the bowl locks into place. The C-200 model can be installed as a freestanding unit against any outer wall of the vehicle. Combine the built-in comfort of RV permanent toilets with the convenience of portable toilets. Plus, cassette toilets have their own waste-holding tanks. Select units with or W/O built-in fresh-water tanks.